Can you tell us a little about your background? How did you get your start in the culinary industry? I first started out in New York’s food and hospitality scene with B.GOOD, as their New York Operations Manager. I helped the brand open their very first NYC store in Brooklyn Heights, and oversaw their whole expansion throughout the tri-state area. Eventually, I took on more of a business development role within the company, focusing on driving sales at their underperforming stores. The position was very hands-on, and gave me the opportunity to hone my natural attention to detail and build relationships with my teams, as well as the community. I later joined Dig Inn on the Strategic Operations team, working closely with one of the co-founders to bridge the gap between business strategy at the company’s headquarters and day-to-day operations in the field. These past positions helped me gain the necessary expertise around the ins and outs of operations and managing a full team, which I now apply every day at Upside. 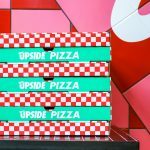 How did the idea for Upside Pizza come about? Upside was a vision that I always had. 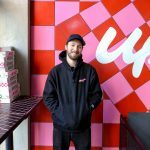 I grew up eating and loving pizza and wanted to create a nostalgic space that brought me back to the pizza parties of my childhood in the 90s, nodding to the sports and hip hop elements of the era, which were huge for me as a kid. When I first met Eli and Oren, we bonded over a shared love of pizza (they’re from Brooklyn; I’m from just outside the city in New Jersey). 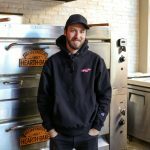 They had the goal of opening a thoughtful pizza shop that was defined by attention to sourcing and prep to create the perfect slice. How did you end up teaming up with Eli and Oren Halali and Anthony Falco? 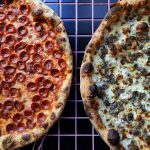 After putting the project into motion, we slid into Falco’s DMs on Instagram with the idea of Upside, and he was immediately super into the concept of a throwback pizza joint making pies using 100% natural fermentation. 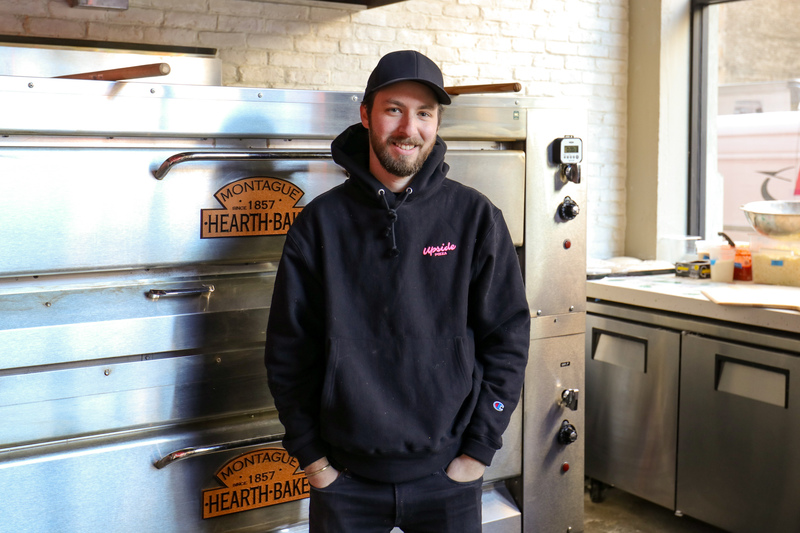 Most of his clients use hybrids of sourdough starter mixed with commercial yeast, so this particular challenge of going the totally natural fermentation route really piqued his interest — there’s not really any other shop doing it in NYC. We were pumped to have him join the team and have him involved Upside’s conception. 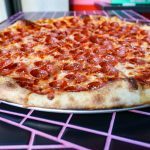 Why is it important to elevate the experience of the New York slice? We all know there’s nothing better than a flavorful, thin and crispy New York slice. So when we say elevated, we’re talking about perfecting those classic elements and making sure our pies are thoughtfully crafted with the highest quality ingredients. Pizza is such a staple and so ubiquitous, but it’s hard to find this level of technique at a small slice shop. We’re not cranking out quick-made pies. We’re working tirelessly to make our pies memorable, and the absolute best they can be. We want people to leave Upside with a lasting impression and a new favorite slice. 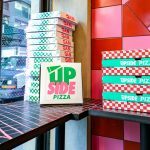 What makes Upside different from other pizza shops in the city? 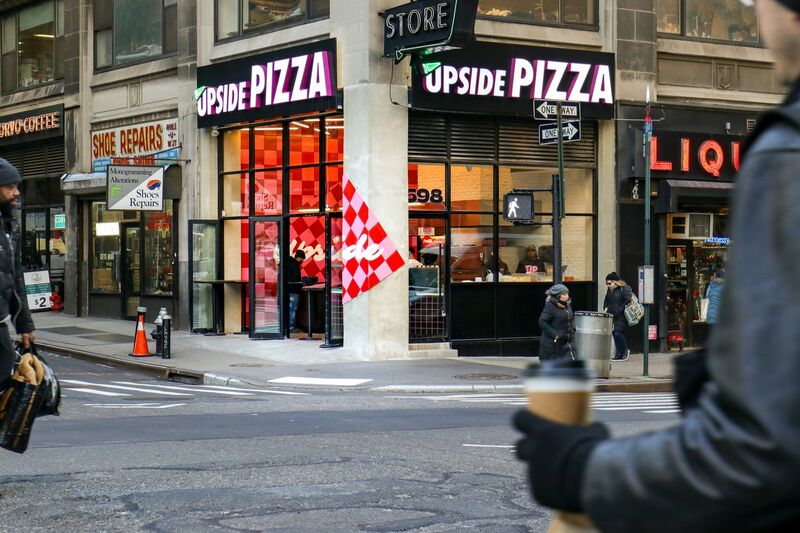 Our dough definitely makes Upside stand out from all other pizzerias in New York. It’s 100% naturally leavened, made using a sourdough starter and unbleached, unbromated flour, and takes a full 72 hours to rise. 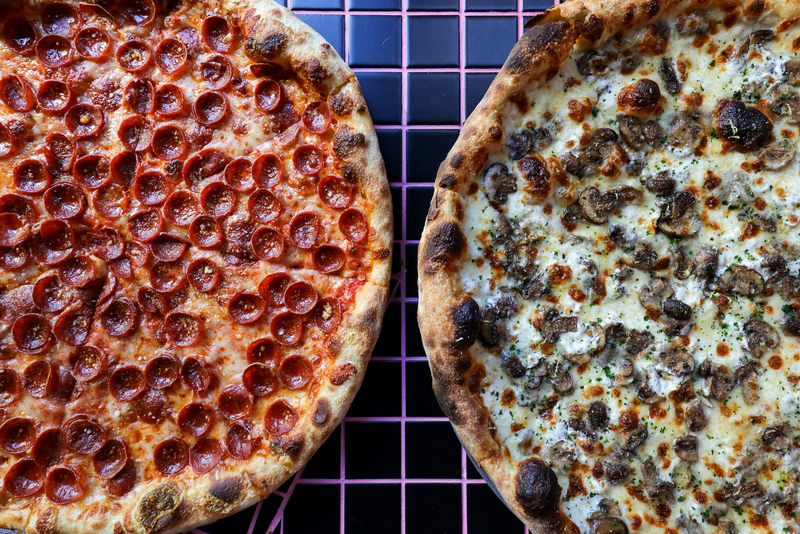 There isn’t another slice shop in the city using dough like ours. On top of that, we’re cooking the pizzas in a Montague Hearth Bake brick oven, which is rarely used in NYC pizzerias. It was the same oven used by the legendary Pizzeria Beddia in Philly. It’s completely brick lined, top to bottom & on the sides, giving off the perfect balance of evenly distributed, gentle heat while baking pies. We’re also incredibly meticulous when it comes to ingredients. 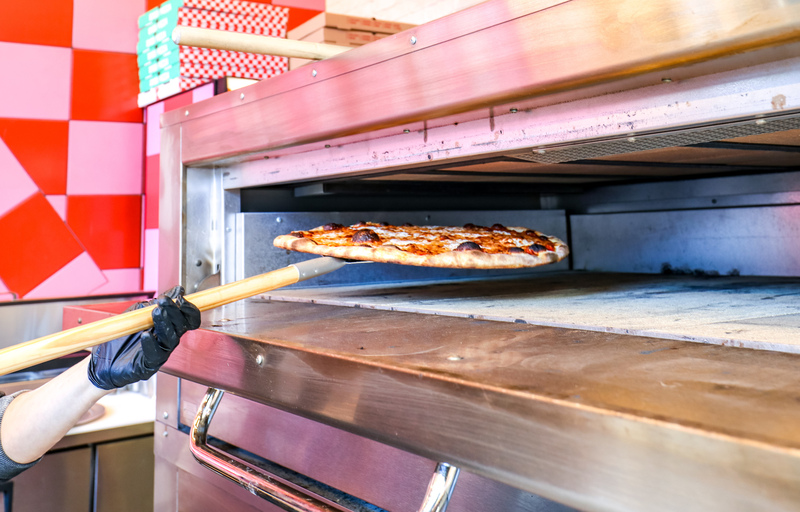 Nearly all of our pizza toppings are made in house — special spice blends, breadcrumbs, sausage, freshly sautéed mushrooms, and we cook and stretch homemade mozzarella every morning in the kitchen. We’ve also created two unique sauces for our pizzas: one for Sicilian and one for regular round pies. The rest of our ingredients are responsibly and carefully sourced. We strive to find only the best small, quality partners that we can support and work with for a long time to come. Can you briefly describe the special water filtration system you use and why it’s necessary? Our water filtration system helps us to create a more pure product, and leave out anything we don’t want in the pizza. No offense to our great NYC tap water, but let’s be honest — do we ever really know what’s going on in an old building’s pipes? The filtration system allows me to properly monitor our dough for spot-on consistency in flavor and rise. 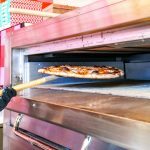 It’s an additional element of control within the entire pizza making process, which is super important. Why did you choose a 90s-inspired design for the space? 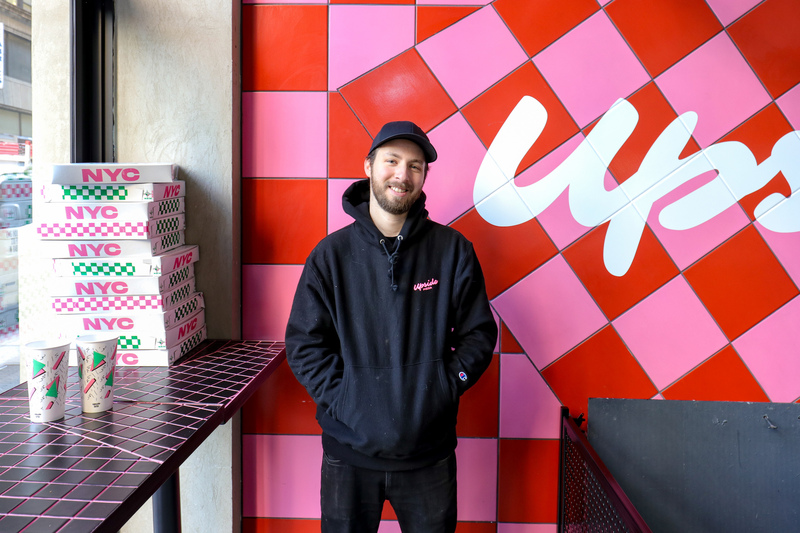 We were inspired by the nostalgia of being a kid in the 90s when hip hop and sports reigned supreme, and local pizza parlors were places of community gathering. Everything from our colors and logo, to our cups and merchandise, evokes the aesthetic of this era. What the tiny, 330 square-foot shop lacks in physical size, it fully makes up for in personality. 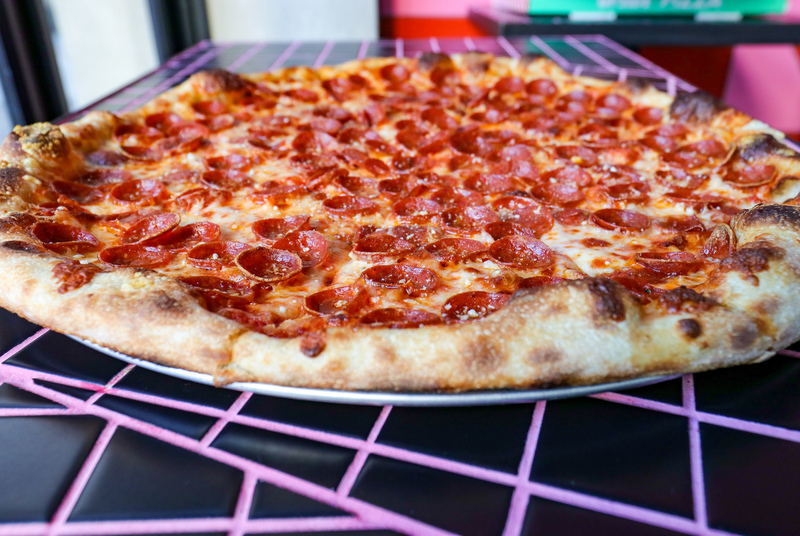 We were drawn to bright, fun and funky elements that would make our corner slice joint stand out and make some noise in a city that’s already full of great pizza places. 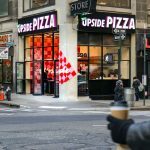 How did Upside Pizza land in the Garment District? The Garment District is full of so many different demographics and we’re able to reach a wide range of people — from local residents to tourists, office workers and construction workers. We’re located on the corner of 8th Avenue and 39th Street, only a few blocks away from Times Square, the Port Authority Bus Terminal, and Penn Station, so the area is packed with a lot of activity and is truly a bustling and vibrant hub. We really love the energy. 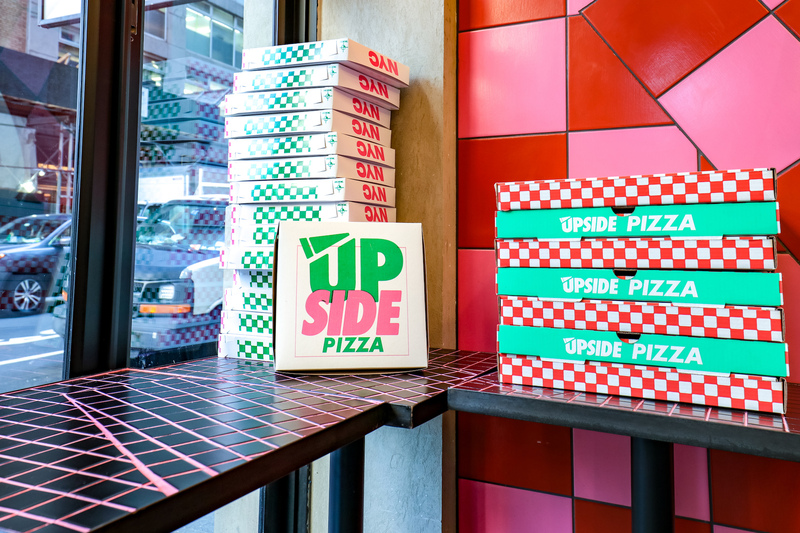 Besides Upside and 2 Bros. Pizza, what is your favorite pizza place in NYC? Lucali in Carroll Gardens has exceptional pies as well as calzones. I’m a big fan of saucy pies with a whole lot of basil, and this place nails it every time. It’s perfect for enjoying pizza in a relaxed, sit-down setting, and also makes for a really great date spot. I also love that it’s BYOB — just roll up with a bottle of wine, and if your table isn’t ready yet they’ll give you a glass so you can drink while you wait. Mark Iacono’s work is inspiring — genuine labor of love, which I really respect. Hey Mark, if you’re listening out there, let’s grab a slice together sometime. 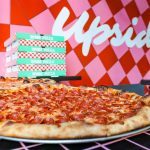 What’s next for Upside Pizza? Any plans to expand? Yes, there are definitely plans to expand down the road. But for now, we’re focusing all our efforts into building and strengthening the first Upside shop. We’ve also got a few exciting collaborations in the works, like a new merchandise line with clothing company, Ovadia & Sons. Does the subway ‘Pizza Principle’ still hold?